Security forces shot dead 16 protesters at several demonstrations across Syria on Friday demanding the removal of President Bashar al-Assad, one of the main activists’ groups coordinating protests said. The deaths included the first protester to be killed in Syria’s second city, the commercial hub of Aleppo, the Local Coordination Committees said in a statement. The group said it had the names of the 16 civilians, among them three killed in Damascus suburbs and eight in Homs, a city of one million people where the presence of tanks and troops has not stopped people from holding big protests demanding political freedom and an end to Assad’s autocratic rule. Syrian human rights campaigner Ammar Qurabi said Central Security personnel had shot dead one demonstrator in Aleppo when they fired at several hundred protesters in Saif al-Dawla, a major street in the city centre. Protests in Aleppo, a mostly Sunni city with significant minorities and a rich merchant class with close links to the Alawite ruling hierarchy, had been largely confined to its university campus and outskirts. 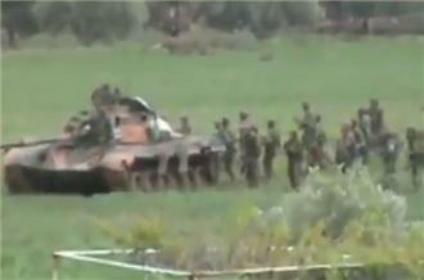 State television said gunmen shot dead a member of the security forces in Homs. The authorities have consistently blamed “armed terrorist groups” for the deaths of civilians and security forces. Human rights campaigners have said scores of troops and police have been shot for refusing to fire at protesters.